The Baroque style has an aura of “I know it when I see it” but there are some defining characteristics. Let’s go at them! Named after the Portuguese word (barroco) for an irregularly shaped pearl, the Baroque style held sway during the 17th century. It began in Italy around 1600 and was brought to France by Catherine de Medici when she married the French king, Henri II. Cardinal Mazarin, prime minister to Louis XIII, further fostered the style. Baroque reached its fullest expression during the reign of Louis XIV (known as the “Sun King”). Louis XIV-style is commonly used as a synonym for Baroque, but this characterization is too limited since the style spread beyond France throughout Europe. Think magnificent and opulent. Ornamentation was overscaled, and featured cherubs, floral ornaments and acanthus leaves coupled with architectural motifs like columns and pilasters. Look for exaggerated S curves and large mirrors. Every inch of the Baroque room was heavily decorated. Ceilings were often painted with celestial scenes. Sumptuous textiles were used like silks, velvets and damasks, all with large-scale patterns. Saturated color palettes, including golds, burgundies and rich blues, dominated. 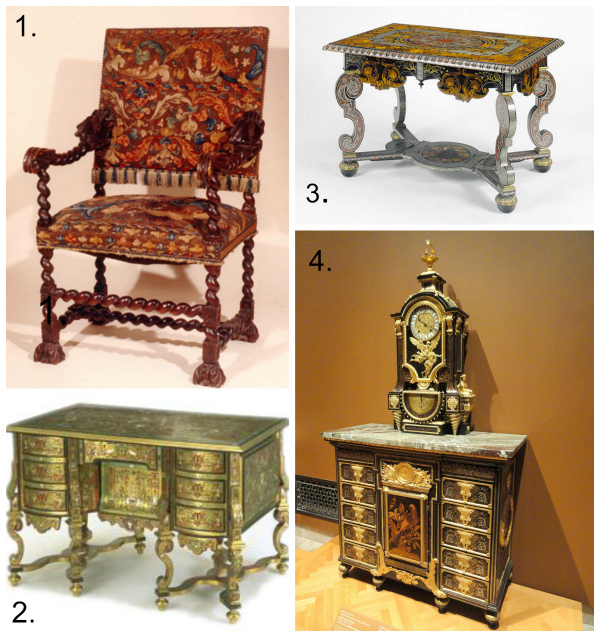 Baroque furniture also is overscaled with extravagant, heavily carved ornamentation, and often rectilinear. Chairs are throne like. The console table is new. Many tables and case pieces had x-shaped stretchers. Pieces where decorated with marquetry, intarsia, pietra dura, lacquer and gilding or parcel gilding. (If don’t know these terms, leave a comment and I will address them in a future post). 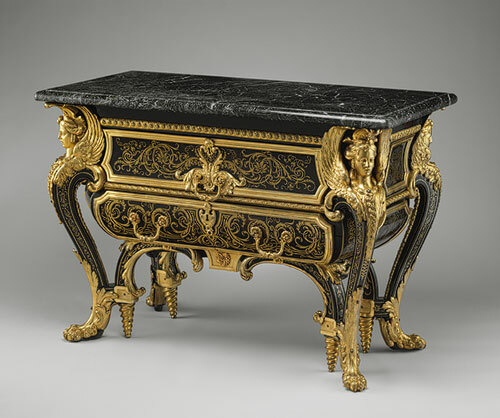 The ebeniste (French for cabinet maker) Andre-Charles Boulle was the leading furniture maker. He perfected a distinctive variation of marquetry in tortoiseshell and brass, combined with ebony and occasionally ivory, so widely copied it became known as “Boulle” marquetry. Sometimes, it is easy to confuse the Baroque style with the Rococo style, which slowly evolved after it. It can help to think of the Baroque style as heavier, more masculine and rectilinear in contrast to the somewhat lighter, feminine and curvier Rococo. Moreover, the Baroque style used rich, bold hues while Rococo often featured pastel colors. 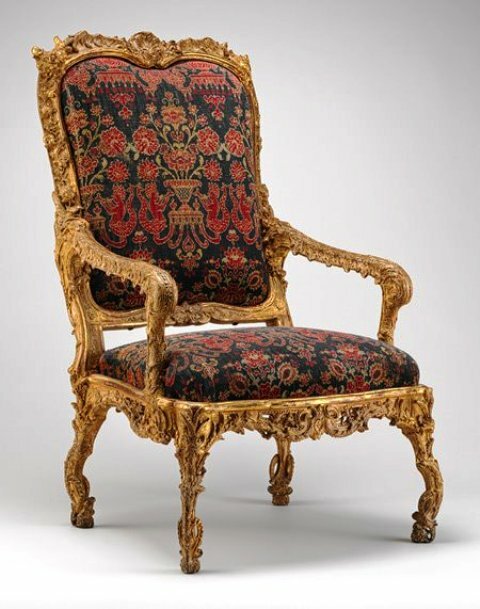 This c. 1710 chair begins to anticipate the Rococo with its arched back, scrolling arms and incurving legs. 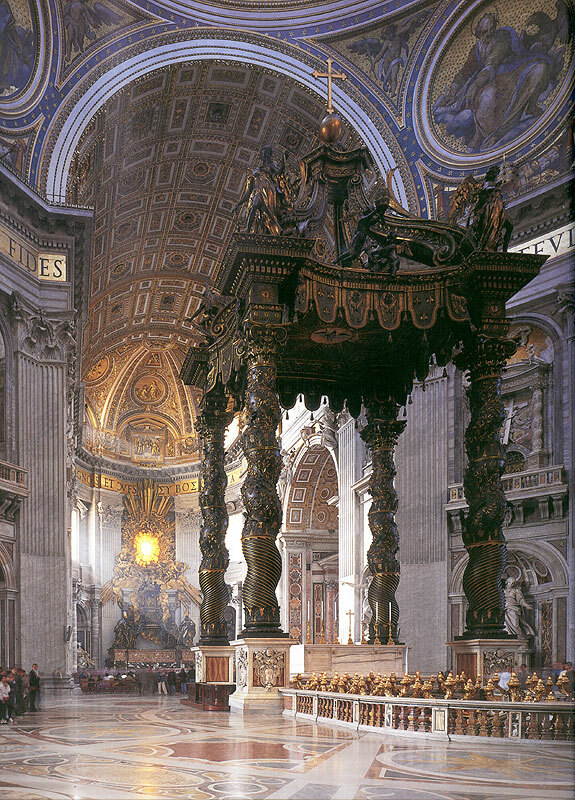 The Baroque style impacted both music and art. The lavish painting style involved clear simple forms with dynamic movements and theatrical effects. Famous painters include Caravaggio, Rubens, Rembrandt and Van Dyke. Bach, Handel and Vivaldi are among the composers. The Baroque style continues to impact design today. A Baroque frame on the ceiling of a bedroom in Victoria Press’s London townhouse, with a contemporary painting in the Baroque style by Wally Carvell in the center. Dolce & Gabbana’s Fall 2012 collection shows influence from the Baroque style. Photo credits: St. Charles Church St. Peter’s Rome Boulle, Cherub King’s bedroom Versailles Furniture Collage:1. An Italian Chair. 2. Mazarin Writing Desk, 1685-1700. Marquetry of brass, ebony, ivory, mother-of-pearl and clear toroiseshell or horn with painted paper backing, on a pine carcase. 3. Attributed to André-Charles Boulle French, Paris, about 1680 Oak veneered with tortoiseshell, pewter, brass, ebony, horn, ivory, and various natural and stained woods; gilt-bronze mountsa 4. clock and cabinet attributed to Boulle chair with some Rococo elements from the Met. mirror from Desire to Inspire Victoria Press townhouse from T magazine. Fashion photo.